Bengal; expect more than your expectation ! Come…visit & explore Bengal, the most Culturally and Ethnically diverse, the first Capital in the State of India, the land of the erstwhile Zamindars & Nawabs! The region with the most listed and recorded Heritage buildings but still creating space for Modern architecture wonders. Where Rustic village life co-exists besides Modern metropolis high rises and Bullock carts running parallel to Audis, BMWs, Mercedes. Birthplace of Nobel laureate Rabindranath Tagore. Home and resting place of Nobel laureate Mother Teresa. Nobel laureate Amartya Sen. Oscar recipient Satyajit Ray. Karmabhumi of Swami Vivekananda and Shree Ramakrishna Paramhansa. Region of the holy river Ganges and the mighty snow capped mountain Kanchendzonga. The Royal Bengal Tiger in the world's largest Mangrove forest. The revered temples of Goddess Kali, majestic Victoria Memorial, the towering Howrah Bridge, India's first underground Metro Rail. The Mecca of Cricket the Eden Gardens is in Kolkata. Worlds highest operational Railway Station and longest recorded Railway Platform. India's only operational cablecar Tramways and hand pulled Rickshaws. Five days of continuous religious festival in Durga Puja, Deepawali, Christmas Eve, New Year and Eid are celebrated with equal zeal. The much elaborate Bengali cuisine for its famed Mustard Hilsa fish and Prawn curries. A wide variation of Street Food culture. Desserts in Rosogolla, Sandesh and Mishti Doi, the famous Malda Mangoes. The six yard wonder in handloom Sarees worn by the Bengali women and Dhuti Punjabi by the Bengali gentleman. Jatras (open air theaters), Palli Geeti (village folk song), Bhatiyali (songs of the boatmen), Baul and Chhou (rural music & dance) will keep you mesmerized. World famous Bengal Terracotta and Clay models, Silver and Brass filigree are made here. What Vodka is in Russia Bangla (a local liquor) is in Bengal. What Hot Dogs and Burgers are in the West - Luchi and Aloo Dum are in the East. What Fish-n-Chips are to an English Chops-n-Cutlets are to a Bengali. What Manchester United is to a fan there Mohun Bagan is to a fan here. What Thames is to London Hooghly is to Kolkata.What Miami beach is to an American Digha beach is to a Bengali. What Alps is to Switzerland Kanchendzonga is to Bengal. What Masai Mara and Amazon is to Africa Dooars and Sunderban is to Bengal. What Drums is in Rock music Tabla is in Bengali music. 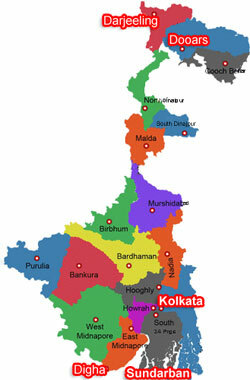 Visit Bengal Tourism before you visit West Bengal. The list is endless; where else can you find #beautifulbengal ? Come & experience Bengal Renaissance in a #bengalicious way !